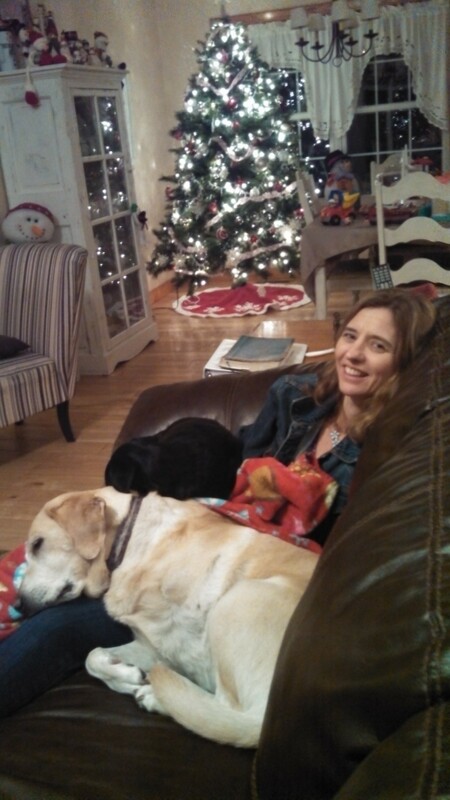 The little black dog is harder to see all snuggled on my lap. One of my favorite pictures of the dogs, my buddies. What a beautiful Memorial Day morning. As I sat on our back patio reading my bible and drinking my morning coffee the realization of all who sacrificed everything for the freedoms I was enjoying in that very moment was overwhelming. There are so many to whom I owe my humble gratitude Jesus, American soldiers, my parents… My attention then turned to my furry friends who had joined me. Our small dachshund /Lhasa Apso mix dog in the chair beside me and our three legged wonder Yellow Lab dog lying beneath my chair. Our little dog tends to be more of the family annoyance. She is an extremely selfish and nervous creature. She would eat until she literally exploded. She seeks opportunities to steal any kind of snack from anyone not paying close enough attention. Snappy and grumpy if she is not getting her way her selfishness, her looks of paranoia, and nervous habits often tend to be the center of family jokes. Her choice human happens to be me and she only seems content when near me and/or eating. Our sweet rescue dog is quite the opposite. Her quiet and peaceful demeanor has made her a true family dog. Completely unselfish in her love and affection for the entire family she shows pure gratitude toward anyone who cares to rub her belly or scratch behind her ears. Her patience with the little dog amazes me. At times I have observed her leave a few bites in her bowl of food for the little one to devour. It took the work of four families to rescue this precious pet. That is a whole other story of God’s timing that I will share sometime. When the time comes that the little dog passes I am quite sure that I will be the only one to shed a tear for her. Her lack of affection for others and selfishness has not made a great impact on this family. On the other hand when our sweet three legged wonder passes there will be great mourning in the Lucas household. It is amazing to me how we as humans will feel the loss and mourn for lives of ones who truly loved and led lives of sacrifice for others. When a selfish power hungry dictator, politician, or shrewd businessman departs from this life there actually may be a celebration instead of mourning. Our human response is so amazing in that we long for love and selflessness yet the attitude of do what is best for “me” overpowers and most often prevails. Jesus was the ultimate example of God’s love. He demonstrated the perfect life of selflessness and sacrifice. The bible clearly provides the knowledge and wisdom of salvation from our selfish tendencies. God’s word reveals the true source of love. Often as I observe the world the two things that seem most hated are Jesus and the Word of God. Maybe like our little dog the world is so content in its self- absorption that there is a nervous fear of letting go of the self -made prison. We miss out on such a blessing in this life when we focus on ourselves instead of others. When we trust in Jesus and turn our selfishness over to Him the love he pours into our hearts is indescribable. Our little dog misses the blessing of enjoying the whole family in her little anxious world. Our three legged dog has this love thing down pat. Don’t let the opportunity to allow Christ’s love to fill your heart pass you by. There is tremendous freedom in giving Jesus more of my selfishness and allowing him to replace it with love. Philippians 2:3 “Do nothing from selfishness or empty conceit, but with humility of mind regard one another as more important than yourselves” Romans 5:8 “But God demonstrates his own love for us in this: While we were still sinners, Christ died for us.” There are so many verses on human selfishness and on God’s love. It is hard to pick just one or two.